Rachel Dunscombe talking about openEHR. 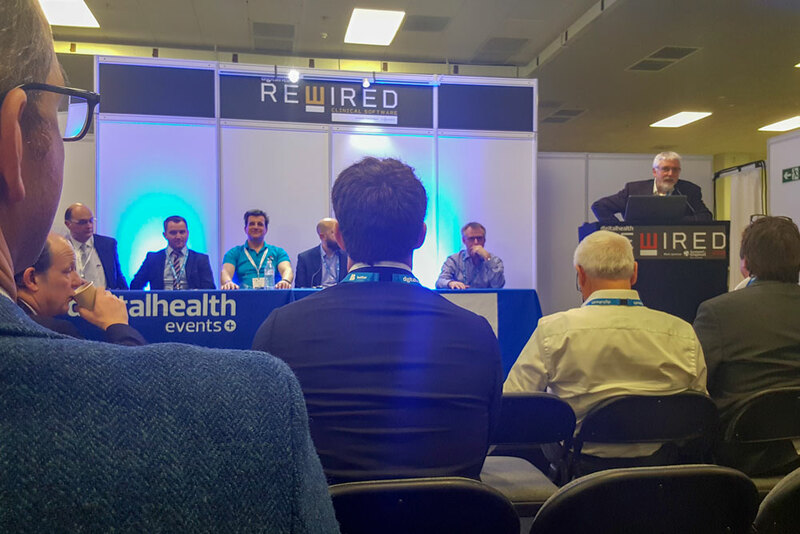 Open thinking ran through the first Digital Health Rewired at Olympia London. Lyn Whitfield reflects on how policy, standards and deployment have changed since the idea was last in fashion a decade ago. The coalition government that came to power in 2010 followed through by “dismantling” the National Programme for IT, flirting with the idea of an open-source electronic patient record based on the US VistA project, setting up Code4Health to “teach 50,000 clinicians to code”, and creating a “transparency tsar” to publish NHS performance data. There is, perhaps, a certain irony that NHS Digital is winding-up what is left of Code4Health just as ‘open’ is back in fashion. But ‘open’ ran through the Digital Health Rewired conference at Olympia London like Brighton through a stick of rock. 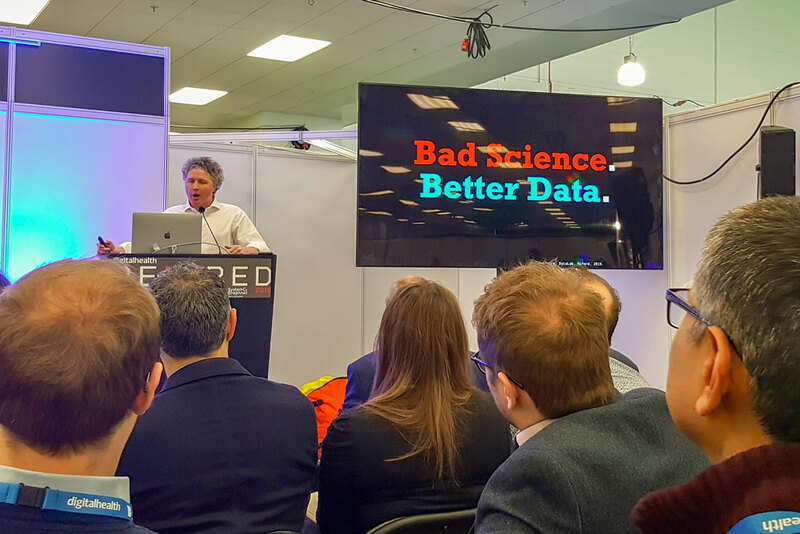 Ben Goldacre talking about open data and open analysis. The tone was set by Ben Goldacre, the ‘Bad Science’ author who runs DataLab from an offshoot of Oxford University, and chairs health and social care secretary Matt Hancock’s HealthTech advisory board. Once he’d got the venue’s flaky wi-fi working (“it’s worse than A&E…”) he put up a series of slides to show how easy it was to present data badly. However, he argued that the “worst graph is the kind of graph that is never made at all” because analysis is not being done, or it is being hidden from view. Goldacre demonstrated DataLab’s OpenPrescribing which “shows everybody in the country who is prescribing what.” Although the tool supports sometimes uncomfortable analysis of GP prescribing trends and policy responses, Goldacre said it is rarely challenged. “I think that is because everything that we do is open. All our code is on GitHub, we document everything as we go along, we publish as open data.” NHS programmes with significant data elements, such as the Model Hospital and Getting It Right First Time, should adopt the same mindset, he argued. They should open their data for academic analysis – instead of relying on outsourcers. And private providers, like Babylon Health, which has faced criticism of its triage chatbot, should do the same. The open theme was picked up by Hadley Beeman, a self-styled “geek who loves health”, and advisor to Hancock, who couldn’t make the show due to Brexit commitments (“although he told me to tell you he’d rather be here”). Beeman added that trusts would be encouraged to place “modular” contracts that would make it easier for them to accept system updates and new releases. The emerging detail on NHSX suggests that it will take a different approach to driving ‘open’ in healthcare from that taken a decade ago. Nobody has floated the idea of using it to develop an NHSVistA 2.0; although NHS England deputy chief executive Matthew Swindells has suggested that an open, cloud-based, “no frills” electronic patient record might be useful to “jump-start” digitisation at laggard trusts. Nor is there agitation for clinicians and other NHS users to become developers. Instead, the idea seems to be that large suppliers will open-up their systems, trusts will become better buyers of tech, and innovators will get to play nicely with both. For this to work, companies will need to be on board, trusts will need to be interested, and the “interoperable data standards” that Hancock is so fond of talking about will need to be in place. INTEROPen panel on FHIR and openEHR at Digital Health Rewired. Speakers at Rewired argued that companies, at least, are on board. Over the past decade, they argued, even the large EPR vendors have accepted that their systems are never going to do everything; and their future lies in becoming platforms into which specialist apps and, increasingly, medical and personal devices can plug and play. In the UK, he pointed out, Scotland has said that its health and social care services digital platform will use openEHR, while two trusts in England have adopted the open e-prescribing system OPENeP. The visibility of openEHR at Rewired was an indication that things have changed in the standards world. Back in the day, the NHS had to create its own ‘interoperability toolkit’ to specify how to shift data from one system to another, one painful use-case at a time. There were years of debate about which standards to go for until HL7 FHIR broke the impasse, INTEROPen was set up, and NHS Digital started working with it on the CareConnect profiles that define how information should be used across clinical care settings using INTEROPen FHIR resources. Even now, there is some way to go. At an INTEROPen session, an expert panel was asked why FHIR had been created as an international standard, only for country specific versions such as CareConnect (and Argonaut, the US version) to be created. Also, whether FHIR is already being superseded by openEHR. On the first point, Ian McNicholl, a director of freshEHR and the openEHR representative on the INTEROPen board, said that, precisely because FHIR was an international standard, it could not be “fully-baked” for different healthcare systems, which would always need their own flavours. On the second point, Amir Mehrkar, the interim chief medical officer at NHS Digital, explained that FHIR and openEHR are coming at the interoperability challenge from different angles. “Patient applications all have different information models, so sharing information means sharing information models,” he said. “At the moment, the way we do that is to say vendors can do what they want, and we will work out how to share information between them, using HL7 FHIR. “Whereas, openEHR says that we should be able to construct and ecosystem in which there is vendor-neutral information inside the applications, as well as between them.” Logically, over time, this would seem to do away with the need for interoperability standards. But the panel argued this was unlikely; and not just because getting every health and care system to use the same information model would take an enormous amount of time and work. David Hancock, client engagement director at InterSystems, and the TechUK representative on the INTEROPen board, said that because openEHR specifies how an information model should be constructed, and not what a standard model should look like, it is possible for systems to use it and still not talk to each other. OpenEHR, he added, is particularly useful for trusts that want to innovate, because they can define and control their information models from the outset; but FHIR is needed to transfer data between organisations. Earlier in the day, Rewired had heard from a trust that has adopted this approach. Rachel Dunscombe, the outgoing chief information officer at Salford Royal NHS Foundation Trust, said it had a well-established EPR, Allscripts Sunrise, that is popular with clinicians, but that it had also created an openEHR platform with Better/Marand, to support innovation. Using Gartner’s Bimodal IT terminology, she said Sunrise was the trust’s Samurai while the platform was its Ninja; the first was always available and well controlled, the second up for 12-week agile projects that may be dropped or iterated at short notice. Not all trusts think like Salford Royal, however; and those that do may struggle to find the cash. Dunscombe said her trust had used some of its global digital exemplar money on the openEHR platform. Outside the GDE and LHCRE programmes, central IT funding is in short supply; and none has been attached to NHSX. In a blog reflecting on what the new enthusiasts for ‘open’ in healthcare might learn from the old, Ewan Davis, chief executive of inidus and a non-executive director of Rewired organiser Digital Health, suggested there is a pressing need to create “economically sustainable business models” for open source suppliers. He argued that this will require “some significant pump-priming” from the centre, combined with action to make sure that trusts put together businesses cases that work for open source suppliers and then consider this option properly. Davis was not convinced this would happen.